If you like math and you love jokes then you've come to the right place as we have the best funny math jokes! 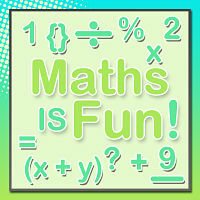 We aim to prove that math is fun as well as interesting. A talking sheepdog gets all the sheep into the pen for his farmer. He comes back and says "Okay, chief - all 40 sheep accounted for." The farmer says, "But I've counted them and I've only got 36!" I hired an odd-job man to do 8 jobs for me. When I got back, he'd only done jobs 1, 3, 5, and 7. What did one decimal say to the other? Did you get my point? Why do you never serve beer at a math party? Because you can't drink and derive. Last night I dreamed that I was weightless. I was like, 0mg. To get to the same side. What kind of tree could a math teacher climb? I hit someone with a scientific calculator the other day. I used the cosh button. A newly-wed husband is discouraged by his wife's obsession with mathematics. Afraid of playing second fiddle to her profession, he finally confronts her, "Do you love math more than me?" "Of course not, dear" she replies, "I love you much more!" Happy, although sceptical, he challenges her, "Well, then prove it!" She thinks for a bit before replying, "OK... Let epsilon be greater than zero..."
What do you get if you cross a math teacher and a clock? I saw my math teacher with a piece of graph paper yesterday. I think he must be plotting something. I saw Pi fighting with the square root of two the other day. I told them to stop being so irrational. Have you heard about the mathematical plant? How many monsters are good at math? None, unless you Count Dracula. How do you keep warm in a square room? You go into the corner, where it is always 90 degrees. Did you know that 6 out of 5 people have difficulty with fractions? Scientists have been studying aliens. They've discovered that their heights are paranormally distributed. Why can't the number 4 get into the nightclub? Because he is 2 square. Why was the math book sad? Because it had so many problems. What is a bird's favorite type of maths? Old mathematicians never die. They just lose some of their functions. An English cat called "1, 2, 3" and a French cat called "un, deux, trois" had a race to see who could swim across channel the fastest. 1, 2, 3 cat won because un, deux, trois cat sank! What did the calculator say to the math student? What DIY tool do you use in maths? What is the best way to find a math tutor? I went into math class today and said to my teacher, "To show you how well I understand fractions, I've only done half of my homework. How many sides does a circle have? Two - the inside and the outside. Why did I divide sin by tan? Why is the obtuse triangle always upset? Because it is never right. Today I saw the number 6 playing with the square root of -1. I thought to myself, "How cute - he has an imaginary friend." Why did the student do her math homework on the floor? The teacher told her not to use tables. There are 10 types of mathematicians. How does a math professor propose to his fiancee? Which snakes are good at math? What kind of meals do math teachers eat? What do mathematicians eat on Halloween? What is a mathematician's favorite season? What did one algebra book say to the other? Don't bother me, I've got my own problems. How does a ghost solve quadratic equations? How does a mathematician plow fields? Why should the number 288 never be mentioned? Why did the circle do a flip?